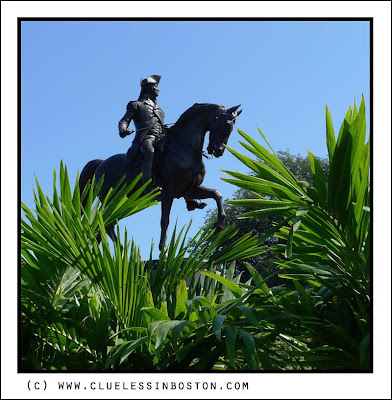 View of the George Washington statue in the Public Garden that makes it look like the tropics. Here is another view that is more commonly seen by visitors. Well composed with great colors and light! Very dramatic! I looked at the other two photos and wow, they're all so different! If you didn't say so, I might not even have thought they were photos of the same statue. Fantastic! It sure looks like he is in the tropics here, cool angle. Just now catching up on your blog. A great slice of life in Boston! Loved the sailboats. So peaceful. Beautiful photo - so well composed. I would have guessed it was Bermuda or some such place. I like that "tropical" look! It does look very tropical!